Join the Earth Mothers Circle! Since 2003 Therese (guided by inner grandmothers and the ancient Clan Mothers) has offered a year-long women’s group that meets one afternoon each month at Sacred Groves. Generally women join the group early in the calendar year and commit to attending regularly throughout the year; some women continue to participate year after year. Earnest women are welcome to join any time of the year. During our time together we create a sacred container, hold a talking circle, share food, listen to a Clan Mother story, spend an hour outdoors in silence connecting with nature, sing and pray, smudge, laugh and hug. In addition, Thérèse offers wise-woman teachings about the medicine wheel and we learn from and with each woman in the group. Cultivate a deeper connection with ancient grandmothers and medicine-women (using the 13 Original Clan Mothers), as well as personal ancestral grandmothers and the wise-one within. Deepen our connection with Mother Earth, her cycles, the energy of the 7 directions and 4 elements, her many creatures, birds, trees and plants. Enliven and empower our inner wise-woman, inspired by women–real and mythical (the Clan Mothers). 2019 Circle: We will meet on Sundays, generally on the 3rd Sunday of the month, 10:30am to 4pm. The Circle includes stories about the Clan Mothers from the book “The Thirteen Original Clan Mothers” (by Jamie Sams). In addition, Therese will shares medicine wheel teachings and women’s songs from the Si.Si.Wiss tradition that tap us into ancient woman wisdom. We will also have a “Talking Circle,” and spend an hour in silence walking in the woods. Commitment: Women are asked to make a commitment to participate in the group as regularly as possible for at least 6 months, since a beautiful intimacy develops among the women who show up regularly. We are sacred witness to each others’ changes, challenges and joys throughout the year. Women are welcome to join the group any month of the year and one-time only guests are also welcome. Money Biz: The fees for this group is $100 every 3 months or $300 for 10 months (full attendance for a calendar year). Paying in advance helps motivate regular attendance. However, if you want to pay one Circle at a time, the fee is $40 for regular participants; $50 for guests/drop-ins (who are welcome when the group is open) Read more about our philosophy about event fees by clicking here. To make your donation on-line….click here. NOTE: The group is closed to newcomers from December 2018 through April 2019. In May, the Women’s Mysteries Retreat happens instead. The group will open for new women again in June 2019. If you are interested in joining this group, please e-mail Therese and request more information. The Earth Mothers Circle is part of a larger fabric called the Sacred Groves Women’s Mysteries School, a weaving of teachings, gatherings, ceremonies and quests. 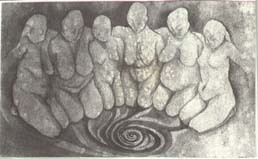 Women involved in the Earth Mothers Circle are encouraged to consider going even deeper into “womens mysteries” by participating in a Spirit Quest, the Women’s Mysteries Retreat and/or events elsewhere such as offerings by Women of Wisdom, Womens Way Red Lodge, and Womens Summer Solstice.